Porsche Enthusiasts Club Forum • View topic - Help! Coilovers / top mounts ???? Help! Coilovers / top mounts ???? Post subject: Help! Coilovers / top mounts ???? Trying to get my 44 ready for its first track outing and have discovered the top mounts are shot. 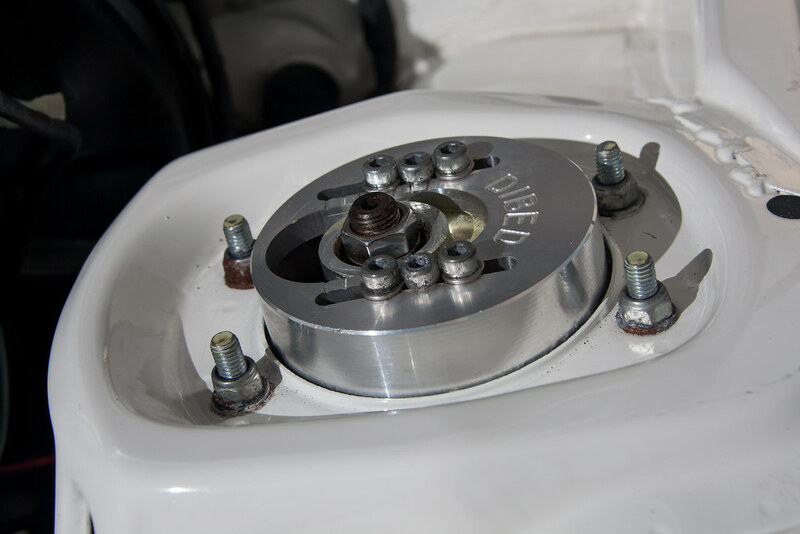 I am currently running spax adjustble psx kit and have bought the below top mounts form 9 products only to discover they raise the ride height - by quite a bit! 3) coilover conversion kit - has anyone ever done this? Is it worth it? My mechanic swears by them and said it would be fine?? 4) buy a new car. Post subject: Re: Help! Coilovers / top mounts ???? Spax do lowering springs, about 35mm from memory. That's probably the cheapest simplest solution. If your planning on many track days you might want to look into coil-overs of some description. Really depends on your budget and goals as to what you go for. So it turns out that with these top mounts you can dispense with the the top and bottom rubber bushings. So if your top mounts have died for £300 these are an excellent upgrade.You cannot buy the originals which there are copies available at £££££'s the bushing are also very expensive so this solutions a great future proof cost save! So far no harsher than the oem bushings but mine were toast so probably not the best judge! These do not alter ride height just drain your wallet. Where did you get them from Steve? They came from evilbay according to his blogspot. Manufactured in Poland. Can’t find the actual seller details on the post but if you do an image search you might get lucky and find the evilbay picture listing and then be able to find the seller. I had the opposite problem when I purchased Gaz Gold set up. I have same mounts as Steve but gaz springs were right height for flat mounts. There are suppliers of coilover springs, work out what height and spring save you want. I've got Gaz Gold with standard top mounts. This works fine as long as the rear is re-indexed accordingly. The end result is a drop of about 60mm from standard, which is nice, and even nicer if speed bumps never existed!! My car had already been re-indexed before I bought it so it worked out fine for me. You would need different mounts to maintain standard ride height as you say.